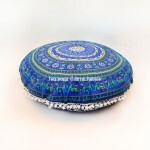 Add few extra sitting in your apartment with Indian round mandala floor pillows. Made from 100 percent cotton, they are unique in design and add a nice, cushy look to your living room. They play vital role if you organize a party for friends and leave impressive look to your floor decor. They do not occupy more space so fit with small living room as well. Besides these pillows are very comfy to sit on. You can use them for watching tv, reading books and doing yoga or meditation. Attractive bohemian mandala designs and vibrant colors make your room interesting and appealing. They come in different shapes and sizes. 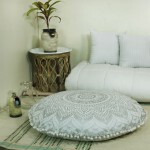 Our 32 inch mandala floor pillows is wide enough and great addition to any room. Browse our floor pillows to invite bohemian vibes. If you love boho interior, you will love them too.